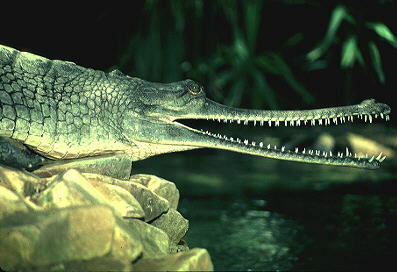 The needle-like teeth of the Indian gharial are perfect for seizing slippery fish, the prey upon which this species feeds almost exclusively. The narrow snout is particularly suited to being swept laterally through the water at great speed - the way in which the gharial feeds, snatching fish as they pass the submerged head. Once seized, however, the gharial lifts its head out of the water to reposition the prey for swallowing - which like other crocodilians cannot occur under water without flooding the oesophagus and trachea with water.